Welcome to Iowa, the Hawkeye State. With its fertile, rolling prairies, Iowa is one of the foremost farming states in the United States. One fifth of the nation's corn harvest is produced in Iowa. Wet springs combined with warm summers create a favorable environment for plantings of corn and soybeans in the state's top-grade farmland. Although agriculture is the mainstay of the economy, Iowa has also encouraged the growth of manufacturing and service industries. If you are going to have large farms, you might as well ensure that you have the right equipment to work those farms, and in that spirit Iowa produced the first gasoline-powered tractor in 1892 (John Froelich, Clayton County). Today, the state claims the largest tractor manufacturing plant in the U.S. The state of Iowa, originally a territory of Wisconsin west of the Mississippi River, was named after the Iowa River. The Iowa River was named after the Iowa Indians who lived in the territory. The tribal name "Ayuxwa" was spelled by the French as "Ayoua" and by the English as "Ioway." "Ayuxwa" means "one who puts to sleep." This popular nickname for the state of Iowa is said to have come from the scout, Hawkeye, in James Fenimore Cooper's The Last of the Mohicans published in 1826. According to the Iowa State web site, "Two Iowa promoters from Burlington are believed to have popularized the name." The nickname was given approval by "territorial officials" in 1838, twelve years after the book was published and eight years before Iowa became a state. The two men responsible for the promotion of this nickname are thought to be Judge David Rorer of Burlington and the newspaper publisher, James G. Edwards of Fort Madison and, later, Burlington. Burlington had been established in 1833 after the Black Hawk War of 1832. Mr. Edwards changed the name of his Burlington newspaper, The Iowa Patriot , to The Hawk-Eye and Iowa Patriot in tribute to his friend Chief Black Hawk. Judge Rorer is said to have suggested "The Hawkeye State" after finding the name in The Last of the Mohicans while Mr. Edwards proposed the nickname "Hawk-eyes" in 1838 to "...rescue from oblivian [sic] a momento [sic], at least of the name of the old chief," Black Hawk. This nickname pays tribute to Iowa's corn crop. Iowa leads the country in the production of corn. Iowa has also been called the "Land Where the Tall Corn Grows," in tribute. Iowa has been referred to as the "Land of the Rolling Prairie" because of the vast rolling prairies that covered the state. People who live in Iowa or who come from Iowa are called Iowans. Upon occasion, Iowans are referred to as Hawkeyes. The Iowa quarter is the fourth of 2004, and the 29th in the 50 State Quarters® Program. 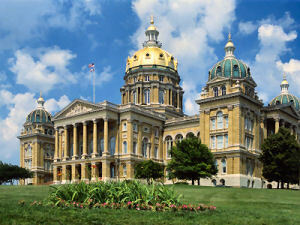 On December 28, 1846, Iowa became the 29th state to be admitted into the Union. The Iowa quarter design features a one-room schoolhouse with a teacher and students planting a tree, and the inscriptions "Foundation in Education" and "Grant Wood." The design is based on "Arbor Day," a painting by Grant Wood, who was born near Anamosa, Iowa. He spent his career as a proponent of small-town values, which he celebrated in the iconic images of small-town plain folk and verdant Midwestern vistas for which he is world-renowned. Iowans have had a commitment to education since the State's earliest days. When Iowa became a state in 1846, it already had a number of rural country schools in each of its counties. Iowa established its first high school in the 1850s, although high schools generally did not become widespread in the United States until after 1900. Private and public colleges also quickly took root in the new State. Although Iowa has long been a leader in agriculture, the State is unique in that it is the only one whose east and west borders are completely formed by rivers - the Mississippi and Missouri Rivers. In May 2002, Governor Thomas J. Vilsack established the 16-member Iowa Quarter Commission, which worked with libraries, banks and credit unions to solicit ideas and concepts for the state quarter design. The Commission received nearly 2,000 submissions, which were narrowed to five candidate themes, including "American Gothic," "Foundation in Education," "Feeding the World," "Sullivan Brothers," and "Beautiful Land." In July 2003, the United States Mint forwarded five approved candidate designs to Governor Vilsack for final recommendation. Three designs were emblematic of the "Feeding the World" theme, and the other two represented the "Young Corn" and "Foundation in Education" concepts. Governor Vilsack chose the "Foundation in Education" design, which was approved by the Secretary of the Treasury on August 26, 2003. Iowa (From Sea to Shining Sea) , by Dynise Balcavage. 80 pages. Publisher: Children's Press(CT) (March 2009) Reading level: Grades 3-5. Presents information about Iowa's people, geography, history, landmarks, natural resources, government, state capitol, towns and cities, and more. Iowa (World Almanac Library of the States) , by Michael E. Martin. 48 pages. Gareth Stevens Publishing (August 2002) Reading level: Grades 4-6. Filled with the most up-to-date information, including the latest Census results. Full-color photos bring to life the story of Iowa. In addition to an in-depth factual profile of Iowa in the form of a state Almanac, this book offers fascinating and lively discussions of the state's history, people, geography, government, economy, culture, and lifestyles. A section on Notable People, a calendar of events, and enough primary source documents, time lines, maps, and other tools to make this unquestionably the best young adult reference material on the USA available anywhere. Iowa Past to Present: The People and the Prairie , by Dorothy Schwieder, Thomas Morain, and Lynn Nielsen. 99 pages. Publisher: University Of Iowa Press (January 1, 2003) Reading level: Grade 5. A textbook for fifth grade students which traces the history of Iowa from its earliest inhabitants to the coming of modern times..
Iowa History Reader , by Marvin Bergman. 470 pages. Publisher: University Of Iowa Press; 1 edition (March 15, 2008) In 1978 historian Joseph Wall wrote that Iowa was "still seeking to assert its own identity. . . . It has no real center where the elite of either power, wealth, or culture may congregate. Iowa, in short, is middle America." In this collection of well-written and accessible essays, originally published in 1996, seventeen of the Hawkeye State's most accomplished historians reflect upon the dramatic and not-so-dramatic shifts in the middle land's history in the nineteenth and twentieth centuries..
Iowa: The Middle Land , by Dorothy Schwieder. 398 pages. Publisher: University Of Iowa Press (September 1, 2006) This history, which focuses on the economic and social history of Iowa, aims to prove that the location of this heartland state has a significant effect on the identity of its inhabitants. It takes the reader from 17th-century Native American habitation, to the sesqui-centennial in 1996. A Good Day's Work: An Iowa Farm in the Great Depression , by Dwight W. Hoover. 256 pages. Publisher: Ivan R. Dee, Publisher (June 25, 2007) Despite beautiful landscapes and bountiful harvests, farming is hard work and always has been. The Great Depression in rural America, which began in the 1920s and lasted until World War II, made it still harder. At a time when tractors were replacing horses and the family farm was giving way to the large, single-crop enterprise, the struggle to survive and modernize in a period of economic scarcity was especially sharp. In A Good Day's Work , Dwight Hoover, who grew up on an Iowa farm in this era, recalls the events of day-to-day life on a single farm, offering detailed descriptions of daily work in each of the year's four seasons. A Good Day's Work is a fascinating if grim reminder of what it was like to be a child with adult responsibilities. Mr. Hoover's unusual memoir recalls the rough edges as well as the happy moments of rural life. It is an honest re-creation of a world that was vanishing.